Mary from Little Red House did a post yesterday about McMansions and her dream home. I thought that would be a fun post so here's some pictures of what I consider my dream home. These first two pictures I took while on vacation on Martha's Vineyard. Look at the brick sidewalk...that was all over the town of Edgartown ~ I loved that! There are blocks and blocks of homes that look like these. Almost every home in the town is white with black shutters. Now you know why I'm obsessed with Martha's Vineyard! These houses are way too big for me but I love that classic Cape Cod style. The house above is from the movie Father of the Bride. I watched this movie so many, many times! 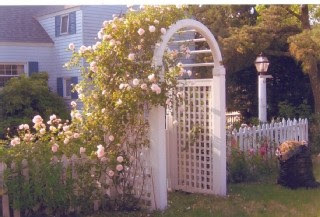 I love picket fences and a rose arbors too. 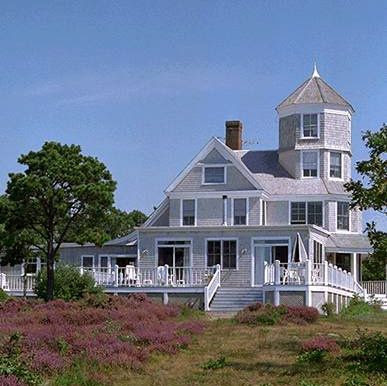 I love the home from the movie Practical Magic too. I've found that a lot of bloggers share this love. I still remember when Victoria magazine did a spread on it before the movie came out. I watched Practical Magic so many times the tape broke inside my VCR and I had to throw it all away and get a DVD player and new DVD of Practical Magic. I still watch it alot. I've always known that I like white houses and as I was searching for pictures for this post I thought I better look for some other colors so I did a Google Search under Images for "elegant yellow home exterior" I got to page 4 and was I shocked to see a picture of my dining room! I didn't find any cute yellow houses so I guess I just have a thing for white houses! Does anyone else want to join in and show their dream homes? Definitely! This will be my next post. These homes are all so romantic and enchanting. I must admit that I share the Practical Magic passion. That home is just the epitome of perfection! What a lovely post. Oh my gosh, Cindy, I just love those Martha's Vineyard houses!!! Beautiful houses,I invite you to come and visit my grandma vitrin.I'm sure you'll like it. 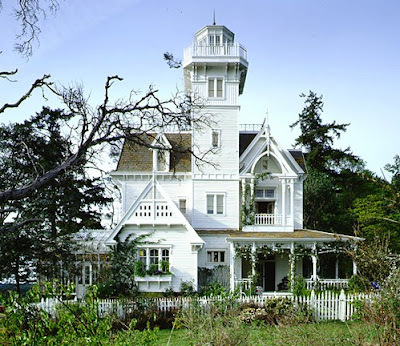 I love Practical Magic and that's one of my favorite houses as well. I've never been to Martha's Vineyard but from the looks of those pictures, I wouldn't mind having one of those either!! I love your choices Cindy. I too love those movie houses. I just rewatched Practical Magic. I never get tired of looking at that house. I think white houses with black shutters are stunning. What pretty homes ! I love Pratical magic too! If you go to this site and click onto each part on the left side of it -it shows lots of photos of the house- garden- etc. of the movie. Will do a post tomorrow of my favorite homes :) Your lil' bunny is in the mail- on it's way to you. Oh jesus! Does homes are so beutiful! My site namne is the same as yourse but in swedish, smile. I can't rmember how I found my way here, but I'm glad I did. These houses are amazing !! Good luck with your dream house. We're working hard turning an old church into our dream home. It's so much fun to dream. Enjoy !! You love white houses the way I love yellow houses!! Mine would look a lot like those first few you showed. Beautiful! This is such a coincidence. Today I was wondering what I would put on my next post and I decided that I would put some photos of houses that I love in the nearby beach towns. I live about 5 miles between these towns - unfortunately, not within them. I love those houses. 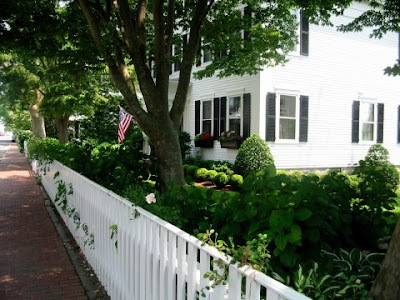 I did a post awhile back showing some houses and picket fences and arbors (which I also love). 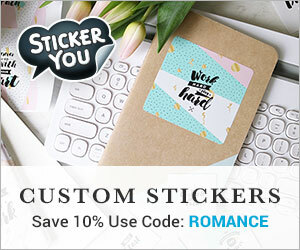 I have your blog on my favorites list. I guess there's a bunch of us that love Martha's Vineyard and homes like the ones you posted. Most of us will never get one but it's so much fun to dream. 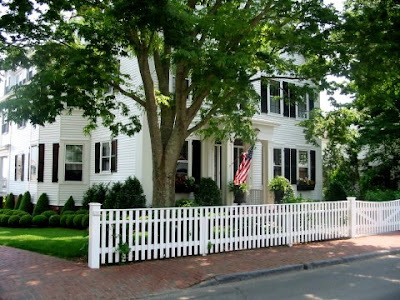 I love white cape cod homes with black shutters. My favorite homes though are vintage farmhouses. They can be Cape Cod style, Victorian, Stone....just old farmhouses....I will see if I can find some to post. These homes are just beautiful!! I love the little stone cottage in The Holiday and of course the Practical Magic house! I remember a Victoria magazine article about the Practical Magic house and it had some of the most awesome pictures....boy that's been a long time ago. Those homes are charming and the autumn collage is delightful. In Mendocino there is the house that was used for Murder She Wrote series and in St Helena is the house from Falcon Crest. 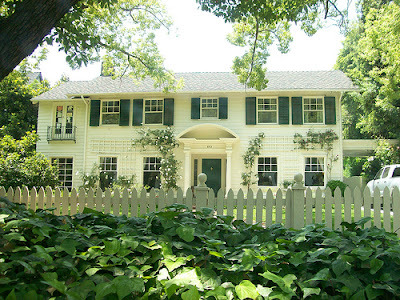 Before I scrolled down to see your text, I thought to myself, "That looks like the house from Father of the Bride." Too funny! City Farmer: these houses are in Edgartown, Susan's house is in Vineyard Haven. It's easily to confuse because so many of the houses on the island look the same. HI Cindy, I'm just dropping in for a quick visit. those houses are beautiful and as much as i would love to have a huge gorgeous house like that, I dont want it unless it comes with a maid!!! my house is tiny and I have enough trouble keeping that up!! hey do you want to link sites? Beautiful houses! And I love the white with the black shutters. They remind me of a place in Maryland called Dickeyville. Rows of old beautiful white houses with black shutters. My daughter used to live there. 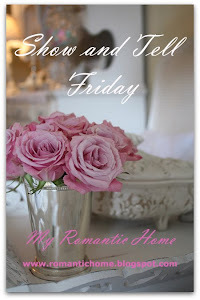 I'm enjoying your blog! I was late to do this but will do it soon...and these are such beautiful places. I'll take that last one! 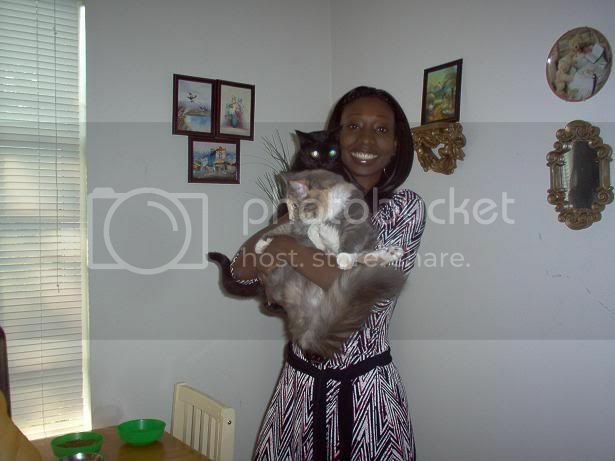 You have been tagged.Come visit my page to see. It is my first time so if your nor interested im sorry. I started a whole section describing my dream house..the one I would have without the boundries of time, money, upkeep etc. etc. etc.! ..and yes - my dream house is white with black shutters. It is obvious though by my barn - you can see I have a black/white fettish! Great post Cindy!!! Oh, I love Practical Magic!! I'll have to get that out and watch it again soon. What lovely houses you've chosen for this post! I love the Father of the Bride House. Loved the movie too. All the photos are dreamy! Just gorgeous! I'd take any of them.